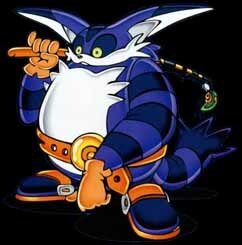 Biography: Big the Cat is sort of a slow character, but he packs a punch. Big doesn't always no what to do at times, and sometimes acts rather childishly, but he is loyal to his friends no matter what. No matter where they go or where it takes him, Big will help friends in need. This is prooven in his first appearence in Sonic Adventure, his whole plot is to go out there and rescue Froggy. Big is a hillbilly cat that lives alone in the woods with his friend Froggy, a normal frog. Big is the tallest character in the univers, probably 7 feet tall. His favourit past times with Froggy are fishing and exploring the jungle they live in. Big can also glide using his umbrella, this would make him a good treasure hunter if they do another Sonic Adventure 2 style game with him in it.